I don't know if it's me getting older or the fact that I have plenty of things to think of, but my memory is a disaster these days.. I keep forgetting stuff, like whether I have answered an email or not, called someone back, and now I even started forgetting which recipes I have posted and which not.. Silly me..
Having said that, I received a message from a lovely lady asking me to post a Lentil Soup recipe, which I was sure I had already done. However, my mind played tricks on me, and it turns out I still did not post one of my favourite soups. My mother makes Lentil Soup a lot at home, so it's one of those dishes which brings me right back to her kitchen.. I added a swirl of yoghurt, which makes it even more delicious in my opinion, but you can certainly omit my non traditional tweak and enjoy the soup on its own. I will leave you with this traditional delicacy tonight, and hope everyone is enjoying a healthy and happy Ramadan so far. 1. In a large pot, sauté the onions until translucent, add the carrots, cumin and lentils and cook for a few minutes. 2. Add the hot vegetable stock, and simmer until the lentils are tender, for about 20 – 25 minutes or more depending on the lentil type. 3.With a hand blender, puree the soup until smooth, add the lemon juice, season to taste and simmer for a few more minutes. 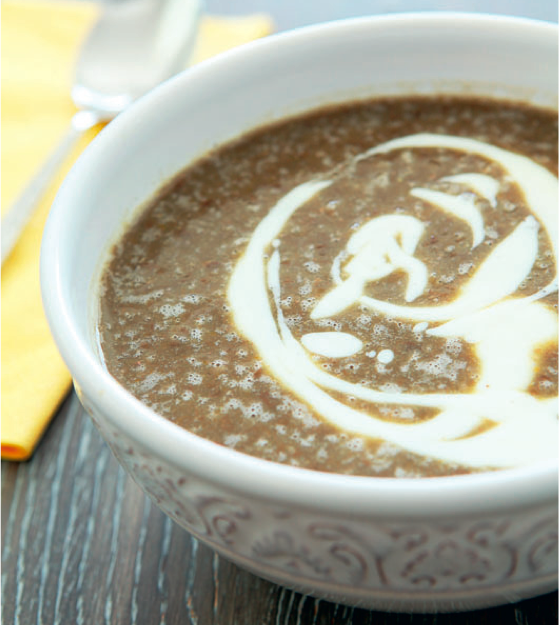 4.Whisk the yoghurt with garlic, salt and pepper and finish the soup with a generous swirl. Delicious! I was wondering though, since I usually don't like vegetable stock, what can it be replaced with? Ghina you can use chicken stock, which will even give the soup a tad more flavour. I used veggie stock in this recipe so it remains a vegetarian dish. Rawan, it's yummy! The yoghurt is my twist to a traditional soup and it fits beautifully. Medeja, I usally use brown lentils, but you can use green, yellow or even red lentils. They all taste a little different and have different textures and cooking times, but at the end make a delicious soup once pureed and flavoured properly.